But anywhos….had workout #3 with my Personal Trainer (PT) yesterday. Did a good 55 minutes…5 minutes short of my alotted time. Had to stop short due to me pushing myself to the point of nearly up-chucking all over the floor. I really pushed myself as hard as i could yesterday, but it felt like my body was really fighting against me every step of the way. Trying to do these step ups (on about a 12 inch step up), my right knee just gave up and got weak…i was able to get thru 2 1/2 sets of 20 of those, but i really wish i could’ve finished them. Even now, though my body was essentially telling me to stop, i really want to finish that last 1/2 set. Is that what they call determination? I think so, maybe? By the 3/4 mark my stomach really started to churn and i pushed thru the last few sets as best as i could, but by the 50/55 minute mark, i knew if i kept going, i was just going to have a very embarrassing moment up-chucking right there in front of everyone. So i called it while i was still ahead. I really pushed myself as hard and as far as i could yesterday, but i know i could do better. My mind knows this…but but body doesnt yet. After cooling off a bit out in the gym, let my stomach settle, my PT, Ausun, told me to sit in the dry sauna for 10-15 minutes to help increase the blood flow to my muscles, and help boost my metabolism, and i suppose also to help sweat out all the toxins in my body from years of unhealthy eating. I really enjoyed the sauna, and felt so much better afterwards. The sauna will be my new best friend after these workouts. All in all, today i can feel EVERY muscle…and i mean E.V.E.R.Y. muscle that i worked yesterday, today. 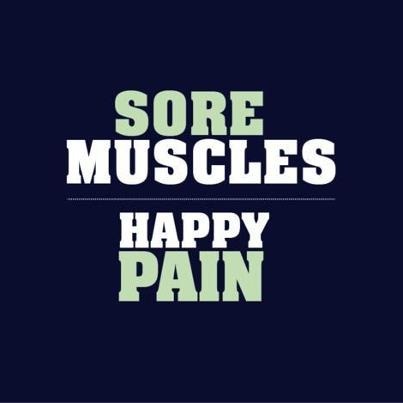 But its a good sore. I know it means that i did push my body to go as far as i can, that my muscles are building and getting stronger. 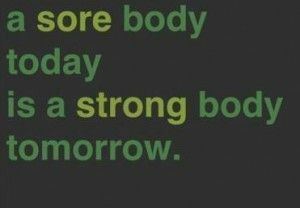 And stronger muscles means my metabolism will increase, and increased metabolism means easier more efficient weight loss. Its a tough physical and mental road i am driving down…but the destination is worth all the pain and suffering that i will endure along the way. Posted on September 22, 2013, in Fitness and tagged gta 5, gta5, hard work, loose weight, muscles, myself, push, sauna, sick, sore, weight loss, work out, workout. Bookmark the permalink. 1 Comment. Reblogged this on joymusy's Blog.